Also available for download: Microsoft Word format (click here - 292 Kb) or Acrobat pdf file (click here 313 Kb). With the ADIAS 2003-2004 season now well under way, it's time to brief readers of the Occasional Newsletter on our plans for the next few months, and to report on the work undertaken since the summer break. The initial focus over the last few weeks has been on further work on the Late Miocene fossils collected near Ruwais during the last ADIAS year and on the carrying out of some further detailed coastal survey work. Already, important new discoveries have been made, both in terms of fossils and in terms of identifying new archaeological sites. At the same time, our outreach programme has continued, with ADIAS staff and associates giving a number of lectures, both here and in Oman, while the text of a new book on ADIAS work has been completed. Printing of this book, scheduled for publication in December, is now under way, with support from the Abu Dhabi Company for Onshore Oil Operations, ADCO. Planning is also under way for a further development of our co-operation with Zayed University. Further details can be found elsewhere in this issue of the Newsletter. Planning is also now being finalised for an extensive programme of further fieldwork early in the New Year, which will, we hope, focus on detailed excavation of an important site on the island of Marawah and on investigation of a site in the deep desert, near Umm az-Zamul. Here, as elsewhere, we will be working in close collaboration with the Environmental Research and Wildlife Development Agency, ERWDA, with results being incorporated into the Abu Dhabi Environmental Database. All of this work, of course, involves extensive expenditure, and we are pleased to acknowledge the receipt of further sponsorship from TAKREER (for research into fossils at Ruwais) and from the Abu Dhabi Company for Onshore Oil Operations, ADCO (for publication of a new book). Details are provided elsewhere. An ADIAS team comprised of Dr Mark Beech (Senior Resident Archaeologist), Simon Aspinall (Director, Environmental Studies Unit) and Dr John Stewart (Palaeontologist, Department of Anthropology, UCL), recently undertook a rapid survey of coastal areas in the Western Region of Abu Dhabi in collaboration with a team from the Terrestrial Environment Research Centre (TERC) of the Environmental Research and Wildlife Development Agency (ERWDA). 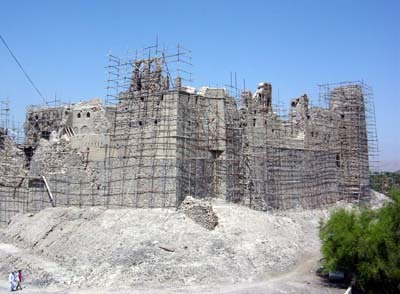 Areas investigated included the Sila'a peninsulae, where previously-known sites on Ra's Farda, Ra's Ghumeis and on Ufzai'yyah were re-examined, the Sabkha Matti, Jebel Barakah and Ruwais. The trip enabled the team to check the mapping of a number of archaeological sites for the ADIAS sites database. A number of new sites were also discovered during the survey including a number of building structures on the western side of the Ra's Ghumeis peninsula, in an area not previously visited by ADIAS. The Abu Dhabi Oil Refining Company, TAKREER, has agreed to provide further sponsorship to ADIAS late this year and early next year for work related to the Late Miocene fossil discoveries at Ruwais. 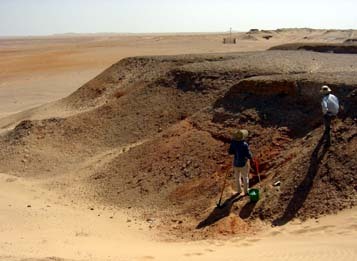 The sponsorship, provided in two parts, is being used to fund the detailed cataloguing and databasing of the more than 5,000 fossils found at Ruwais and to help fund the preparation of a special exhibition both of some of the Ruwais fossils and of early fossil material discovered in the early 1990s by an ADCO-sponsored team from London's Natural History Museum and Yale University (see separate story). Work resumed last month on the study of the fossil remains from the Late Miocene period, dating to around 6 to 8 million years ago, recently discovered by ADIAS near Ruwais, as part of fieldwork sponsored by the Abu Dhabi Oil Refining Company, TAKREER. Nigel Larkin, a specialist in palaeontological conservation, who first visited Abu Dhabi earlier in the year to work on conservation of the 2.54 metre long elephant tusk from the Ruwais sites, came back for nine days to work on conservation of some further specimens. 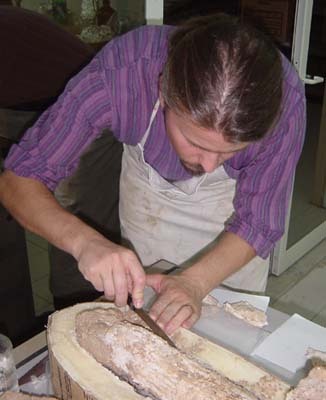 On this visit he worked on a second elephant tusk (1.94 m in length) as well as a pair of elephant mandibles. The conserved items, along with others collected in the early 1990s during work by the London Natural History Museum / Yale University team, will later be put on show in a small exhibition due to be inaugurated during the first half of next year. Also in Abu Dhabi at present is Dr. John Stewart, from the Department of Anthropology, University College London, who is working together with Dr Mark Beech, ADIAS Senior Resident Archaeologist, on the identification and cataloguing of all the Ruwais fossil material. This work should be completed in late November. Once the cataloguing is completed, ADIAS will hold one of the largest databases anywhere of Late Miocene vertebrate fossil fauna. A key aspect of ADIAS work is the publicising of our activities, through publications, (see separate story), press coverage and public lectures, so that people both here in the UAE and elsewhere are informed about our work. So far this autumn, four lectures have been given on ADIAS-related activities. In Abu Dhabi, our Senior Resident Archaeologist, Dr. Mark Beech, gave a lecture to the Emirates Natural History Group at the Cultural Foundation on 7th October. The lecture was entitled "Elephants in the Desert: discovery of a new Late Miocene fossil site at Ruwais, Western Region of Abu Dhabi". This was followed by another lecture from Mark to students at the Petroleum Institute in Abu Dhabi on 11th October. The lecture was entitled "The Environmental History of Abu Dhabi Emirate: a palaeontological and archaeological perspective". On 14th October, Dr. Michele Ziolkowski, our Fujairah-based ADIAS associate, spoke to the Emirates Natural History Group on her current research at Fara and the Wadi Farfar in Fujairah. Michele co-ordinated on behalf of ADIAS the detailed survey and excavations in the Wadi Saqamqam, near Fujairah, earlier this year. The work was sponsored by Dolphin Energy Limited. A fourth lecture, again by Mark, was given in Muscat, Oman, in late September (see separate story). New links to the ADIAS website have also been established with the websites of the School of Oriental and African Studies at London University and of the University of York. Details are as follows (follow links to ADIAS). These have helped to prompt a further significant increase in the number of daily accesses being made to the ADIAS website, further helping to spread information about our activities in the international academic community. A delegation from the Abu Dhabi Islands Archaeological Survey (ADIAS) comprising Dr Mark Beech (Senior Resident Archaeologist) and Karen Cooper (ADIAS Asmin assistant) visited Muscat in the Sultanate of Oman from the 27-29 September 2003. During the visit they met with representatives from the Ministry of National Heritage and Culture, the Natural History Museum, the Department of Archaeology at Sultan Qaboos University, and the Bait Al Zubair Museum. Fruitful discussions were held discussing future possible collaboration between ADIAS and their respective organisations. On the evening of Monday 29th September Dr Mark Beech gave a lecture to the Historical Association of Oman at the Oil and Gas Exhibition Centre in Muscat. The title of the lecture was "Recent Palaeontological and Archaeological Discoveries in Abu Dhabi". On the return drive from Muscat back to Abu Dhabi brief stops were made at Nizwa to see the old suq area, and in particular to take a pre-arranged tour around the Bahla Fort, currently being renovated with the help of UNESCO consultants. This was kindly organised by the Ministry of National Heritage and Culture in Muscat. As reported in the last ADIAS Occasional newsletter (June 2003), a major new book on UAE archaeology was launched at the annual Seminar for Arabian Studies in London last July. 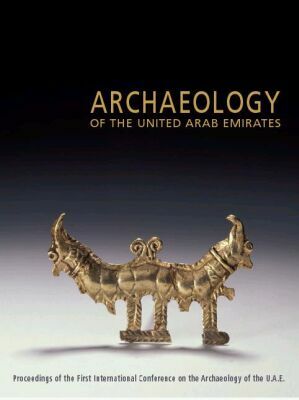 Entitled Archaeology of the United Arab Emirates, it contains the collected papers of the 1st International Conference on UAE Archaeology, held in Abu Dhabi in April 2001, and is edited by Professor Dan Potts, Dr. Hasan Naboodah and Peter Hellyer. Published by the Zayed Centre for Heritage and History, part of the Emirates Heritage Club, in association with Trident Press, the book was launched at a reception at the British Museum. It contains eight papers by ADIAS staff and associates. During the reception, sponsored by Trident Press, ADIAS Executive Director Peter Hellyer gave a short speech on behalf of the publishers and editors, thanking UAE President His Highness Sheikh Zayed bin Sultan Al Nahyan and Their Highnesses the Supreme Council members and Rulers of the Emirates for their support for archaeology in the country over the last forty years, and also thanked Deputy Prime Minister HH Sheikh Sultan bin Zayed Al Nahyan for his sponsorship of the April 2001 conference and the subsequent publication of the book. English language copies of the book are now available to ADIAS sponsors (please contact us if you want one), while an Arabic language version is now being produced. An academic report on the study and excavations of the UAE's only sulphur mines, at Jebel Dhanna, is now in press and should be published by mid-December. 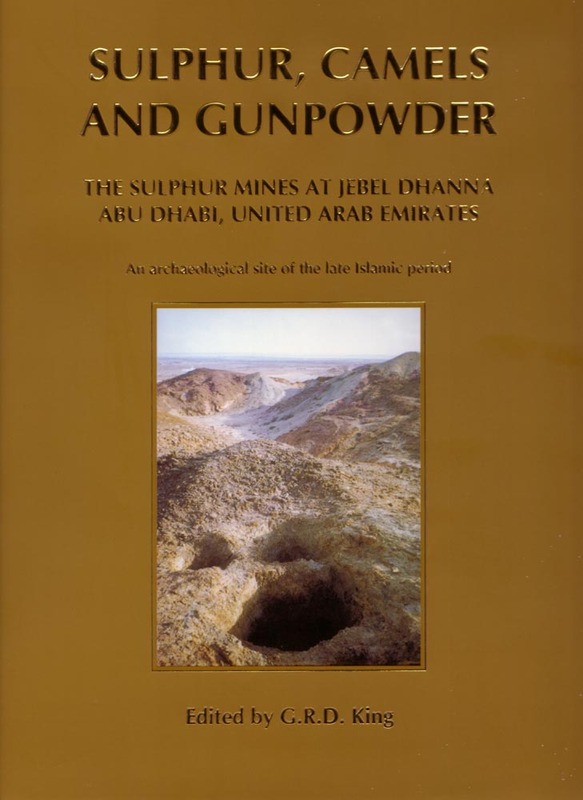 Entitled Sulphur, Camels and Gunpowder - The Sulphur Mines at Jebel Dhanna, Abu Dhabi, United Arab Emirates, the book is edited by ADIAS Academic Director Dr. Geoffrey King, with other contributions by Dan Hull, Steve Rowland, Peter Hellyer, Simon Aspinall, Dr. Mark Beech and Dr. Rob Carter. The book is being sponsored by the Abu Dhabi Company for Onshore Oil Operations, ADCO, which also sponsored several phases of archaeological investigations at the Jebel Dhanna site, with a Foreword being provided by ADCO General Manager Andre van Strijp. The book's launch is being timed to coincide with the celebration by ADCO of its first 40 years of oil exports from Jebel Dhanna, and we hope to work with ADCO in December to show off the sites to some of the Company's former General Managers, who will be visiting Abu Dhabi for the anniversary. The support and interest of successive ADCO GMs over the last thirteen years has been of enormous help to ADIAS. The book is being published by ADIAS in association with ADCO, while distribution is being organised in association with Dubai-based Zodiac Publishing. Copies of the Jebel Dhanna book will be made available later to ADIAS sponsors. The volume is the first in a series of planned ADIAS published site reports. 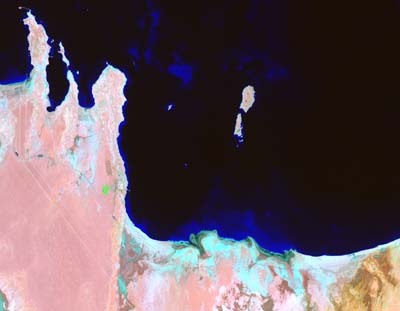 Other publications are being planned on the Dalma Late Stone Age site, Marawah, Balghelam, and on Late Islamic architecture (mainly mosques) on Abu Dhabi's islands. We hope that at least one of these will be published before the end of 2004. Several academic papers on ADIAS work are also being prepared, while a number of the papers presented by ADIAS personnel at the July Seminar for Arabian Studies in London are also to be included in the forthcoming Proceedings, due out next summer.